We aim to give you the confidence to venture into the show ring with your pedigree pigs, success in your mind and with the knowledge that you and your pig are totally prepared to win! This is a two day course and will be beneficial to those wanting to start showing and those who have begun showing but want to further their knowledge and polish their ring skills. In addition it is a very valuable opportunity to those who breed pigs who wish to improve their breeding nucleus through good selection and those considering which pigs to breed and want to know more about breed standards. A good pig is always a good pig. Equally a bad pig will always be just that. 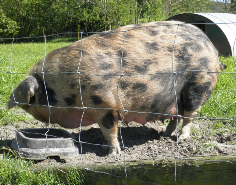 So, even if you decide not to venture into the show ring the weekend provides the basis of future successful pedigree pig breeding and selection. The cost of the two day course is £190. We will provide soup and local bread each day for lunch. We will have pies and sausage to taste. On the Saturday evening we all go out for a meal together – good preparation for the shows as pig people do like to socialise! Send cheques made payable to Carole Barr (pig keeping) to Carole Barr, Crook Barn, Torver, Nr. Coniston, Cumbria LA21 8BP.